Joelina Tirkey of Jumaikela village in Jashpur district of Chhattisgarh lost her father when she was studying in the ninth standard. He was a farmer and had left his wife, three daughters and one son behind. Joelina was the eldest of the children. After her father’s death it became difficult for her family to meet the expenses. Agriculture was the main source of income for them and the family income was not more than 25 thousand rupees a year. Joelina could study only up to 12th standard as the education was free. But after 12th she could not continue her studies further.But Joelina found a way to change her life. She learnt that she can get training under Mukhyamantri Kaushal Yojana and can also get a job. She realised that she can support her family and can pursue higher education with her own money. In 2017, Joelina went to Raipur to get enrolled in a training course. After six months of training she appeared for an interview and got a job at Noida. There she started earning nine thousand rupees a month. With this money she could support her family and pursue higher studies. “I took admission in BSc course. When I asked for leave for my third year examinations there was no objection from my employers.” She says. Joelina’s sisters have also got training under the Mukhyamantri Kaushal Yojana and are working in Noida now. Both of them are drawing a salary of nine thousand rupees each. “Now our family income is twenty seven thousand rupees a month and it is a good amount for us. From 25 thousand rupees a year we have increased our family income to twenty five thousand rupees a month.” She says. 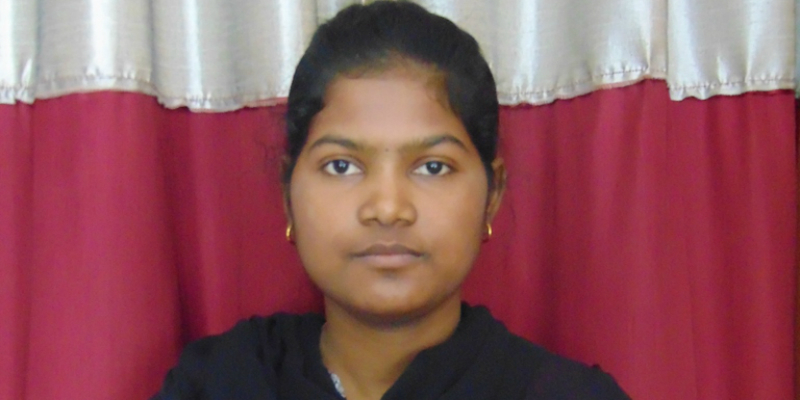 Joelina is now preparing for competitive examinations along with her graduation course. Her sisters are also pursuing their education with the money they are making now. Joelina believes that she and her sisters will be able to achieve much more in life. She is hopeful of a brighter future and is working hard to fulfil her dream. Joelina is thankful to Mukhyamantri Kaushal Yojana. “Without the Mukhyamantri Kaushal Yojana it would have never been possible for us to change our lives. We don’t struggle anymore.” She says. Joelina believes that youths should not be intimidated or demotivated by the challenges they face. “Everyone faces challenges but only the ones who face the challenges with determination and hard work get success.” she says. She encourages the youths of the state to take advantage of various government schemes like Mukhyamantri Kaushla Yojana. Joelina is not the only one whose life has been positively affected by the Mukhyamantri Kaushal Yojana. The scheme has changed the lives of many people like her in Chhattisgarh. Imparting skills to the youth to help them earn livelihood is an objective of this scheme. Prime Minister Narendra Modi has also emphasised on the need of skill development throughout the country in order to turn India into a global hub of skilled manpower. The Chhattisgarh government’s initiatives in this regard are fulfilling that objective of the government of India.